You know exactly what I mean when I say - "Cobbles"
I am speaking of the stone cobbles under the tires of the best Classics cyclists in the world. These cobbles reside in Belgium and France. They are big, even massive, and they hurt. They are the reason why we wake up early in spring on Sunday mornings in the United States to watch men rumble and agonize over their surface. If you love the cobbles, you'll agree this is the best time of year to watch bike racing. 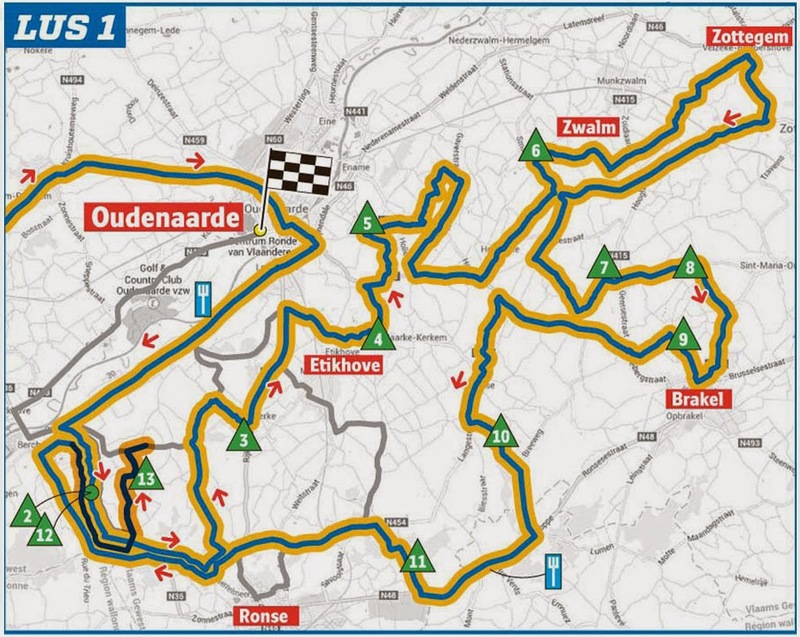 This Sunday is Tour of Flanders, next Sunday is Paris-Roubaix. My guess is you've already booked out your next two Sundays to watch these two "must watch" races. I scour the internet regularly for good information about cycling and cycling travel. This week I searched for websites featuring descriptions (and especially photographs!) of the cobbled climbs in Flanders. I found a few good ones. The sheer act of compiling such information, makes me highly appreciative of the time and effort it took these individuals to provide us with this easy to access information. It is the perfect gift for the armchair cycling tourist. Having ridden or walked upon these climbs makes revisiting them online even more engaging. Even if you haven't been to Belgium, you can imagine what these tough climbs are like by browsing these websites. When it comes to the cobbles - it's all about learning the names and knowing which ones are the toughest. Your knowledge makes the live race viewing that much more exciting. 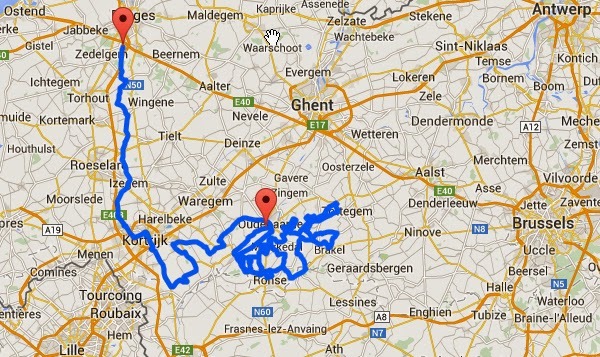 The 99th Tour of Flanders will feature 19 climbs over 264.2 kilometres. 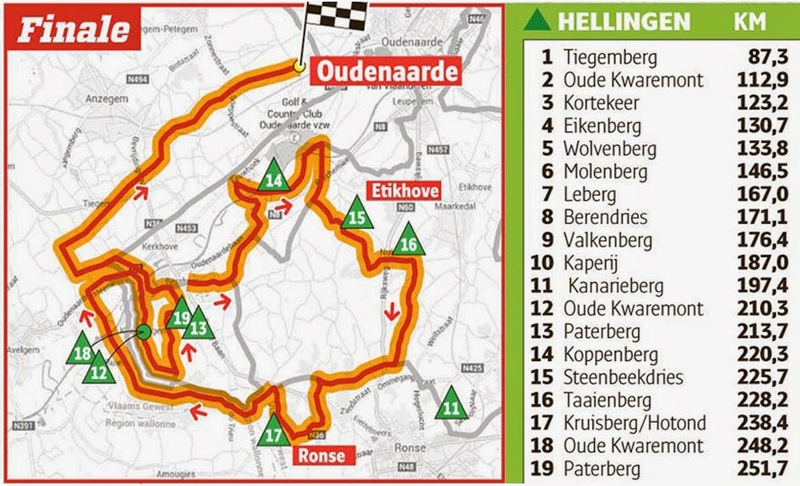 Two additional climbs have been added for 2015, they are the climbs of Tiegemberg and Berendries. The usual tough climbs are included: Koppenberg with a maximum grade of 22%; Oude Kwaremont (climbing it 3 times); and the final climb of Paterberg (climbing it 2 times) at a maximum grade of 20.3%!. After the final climb up the Paterberg the riders have a flat 13.2 kilometres to the finish-line. 1. Tiegemberg (km. 87,3): 5% avg., 9 % max. 2. Oude Kwaremont (km. 112,9 km, first passage): cobbled, 4% avg., 12% max. 3. Kortekeer (km. 123,2): 6% avg., 17% max. 4. Eikenberg (km. 130,7): cobbled, 5,5% avg., 11% max. 5. Wolvenberg (133,8): 7% avg., 17% max. 6. Molenberg (km. 146,5): cobbled, 7% avg., 14% max. 7. Leberg (km. 167,0): 6% avg., 14% max. 8. Berendries (km. 171,1): 7% avg., 14% max. 9. Valkenberg (km. ): 8% avg., 13% max. 10. Kaperij (km. 187,0): cobbled, 5% avg., 8% max. 11. Kanarieberg (km. 197,4): 8% avg., 14% max. 12. 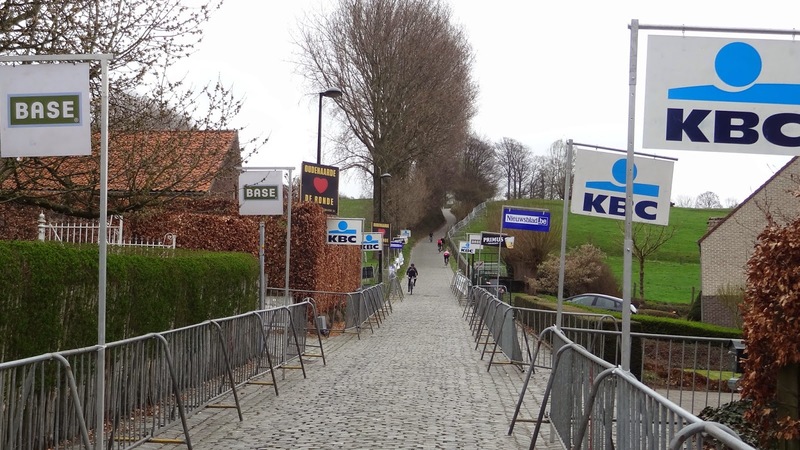 Oude Kwaremont (km. 210,3 km, second passage): cobbled, 4% avg., 12% max. 13. Paterberg (km. 213,7 km, first passage): cobbled, 13% avg., 20.3% max. 14. Koppenberg (km. 220,3): cobbled, 10% avg., 22% max. 15. Steenbeekdries (km. 225,7): 5% avg., 6,5% max. 16. Taaienberg (km. 228,2): cobbled, 6% avg., 18% max. 17. Kruisberg-Hotond (km. 238,4 km, first passage): 5% avg., 9% max. 18. Oude Kwaremont (km. 248,2 km, third passage): cobbled, 4% avg., 12% max. 19. Paterberg (km. 251,7 km, second passage): cobbled, 13% avg., 20% max. Set your alarm clocks for 4:00am if you live in the Rocky Mountains, 3:00am if you live in California! East Coasters get an easier 6:00am wake-up call.